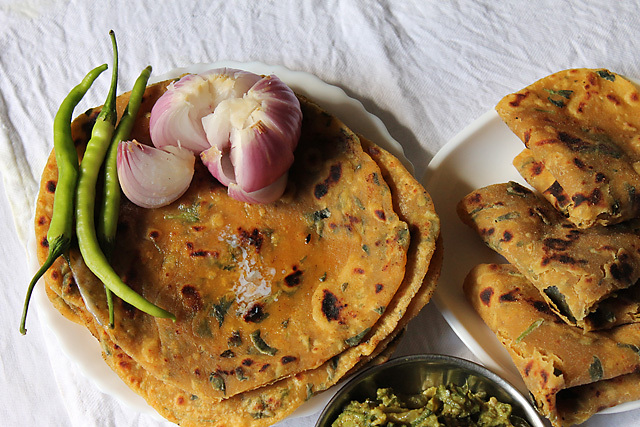 What is Gujarati Thepla ? 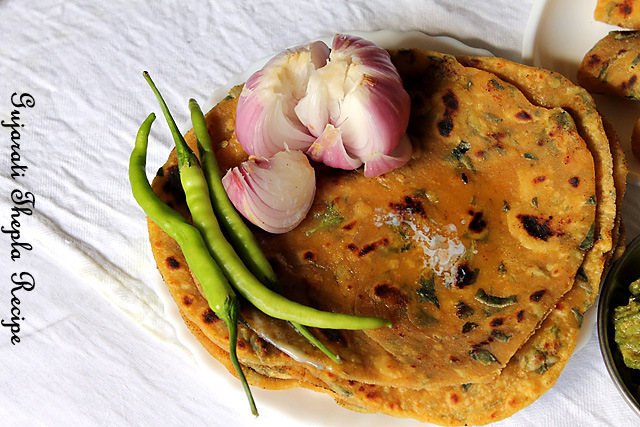 Gujarati Thepla is a flat Indian Bread made of whole wheat + Gram flour + some Indian spices + fenugreek leaves. 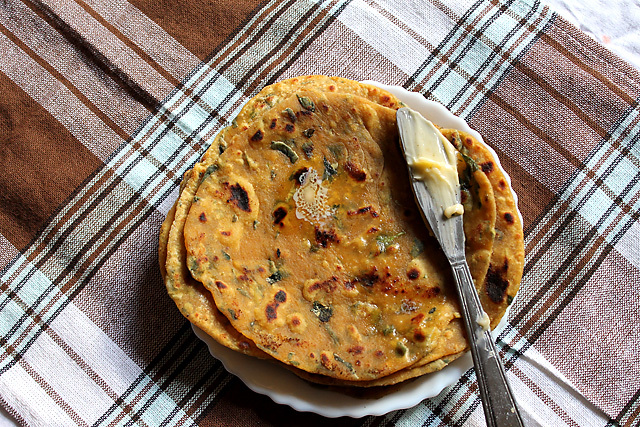 Theplas reign from Gujarat and is their staple diet. Theplas are healthy and are great to carry in lunch boxes, while trekking, travelling Or eat at home. Tried for the first time Thepla trust me they are soft, healthy, tasty and goes well with veggies Or gravies. I just applied some butter to my Gujarati Thepla and had with hot cup of Cardamom tea 🙂 They are just yummy and I can go on and on with them. My hubby also loves Theplas he took some today in lunch box too. Unfortunately I didn’t get time to click snaps for Tomato Chutney. I will surely click pics the next time I make. Honestly I am only cooking and cooking from past few days post a tragic incident which took place in my life. But I have recovered from it thanks to my family, friends and hubby for helping me to come out of it. Anyways as of now surely make these hot theplas ! 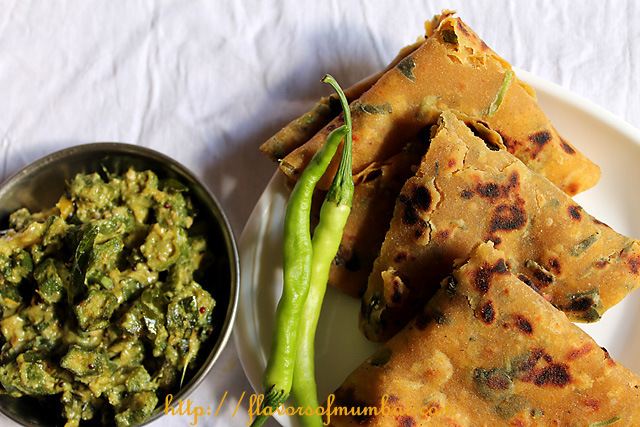 Methi Thepla recipe a flat Indian bread made with fenugreek leaves a healthy snack could be made anytime o the day. First pluck fenugreek leaves and discard their stems. Wash and keep them aside. Sift dry ingredients that is wheat flour, gram flour and all spices except clarified butter, yogurt and water. Mix yogurt with water. Give a nice whisk to it. Now add this mixture to the dry ingredients. Also add the methi leaves. Start kneading the mixture. Use all your stamina to knead the dough. Press towards back to fro with your knuckles and palm. Now add 3 tbsp clarified butter to the dough and knead until smooth and soft. Use more flour if the dough is sticky. If the dough is too dry add little more clarified butter to it. Now leave the dough to rest for 10 mins. Make small balls about 2 inches. Roll them into round Or oval shapes. Take a pan place on high fire. Ensure the pan is hot then reduce the fire. Now place the flat bread on the got griddle Or pan. Once the roti (bread) has small brown dots. Place the other side of the bread. Smear ghee on them and fry them until they cook nicely. Ensure the bread is brown and cooked from both sides. You could use a spatula to fry them. Serve hot with yogurt, pickles etc. 1. Ginger- garlic paste is optional. 2. Fennel seed powder gives a nice taste but you could skip it. Hi. I want to try this recipe. Can u tell me if I can use dried fenugreek leaves if fresh ones aren’t available? Thanks. Sonam yes you can try with dried fenugreek leaves too, let me know how it was? thanks. hi Maria! The theplas look amazing. One of my fave foods:) love the first picture! Thanks for the submission to http://veganchutney.com ! Its a Indian Vegan food photo gallery to help with special diet restrictions. The theplas use non vegan ingredients .yogurt and ghee , so they cant be published. Please do submit some other already vegan entries from the archives! :) Thanks once again! Sure Richa how could I do that … will surely keep in mind and post only vegan recipes ….thanks a ton take care! You can make these Theples even more nutritive by adding Bajri flour, Raggi flour plus whole wheat and besan flour. If you can’t find fresh fenugreek leaves, use chopped spinach or mustard greens. I always make my garlic, cilantro chilies paste ahead of time and freeze it. then its easy to use. Just call me and we can make it together. I love the texture of flatbreads like this. Looks delish. Yeah Alyce this flat bread tasttes yum, crisp and soft. DO try them for sure! You are welcome Sunita 🙂 do make them soon and fulfill your desire ! That close-up is sure bringing me some hunger pangs! This looks so deliciously toasty and flavorful. You did a wonderful job and I hope you made a lot, for they look like they would disappear quickly-yum! Tina you are right it got over in a jiffy 🙂 will surely make more next time!